Samsung has unleashed yet another addition to its Galaxy smartphone range, with the low-end Galaxy Core making its bow this time. 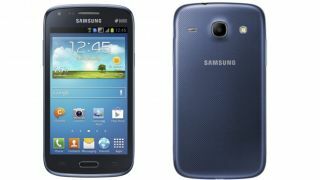 The modest device features a 4.3-inch, 480 x 800 resolution display screen, and runs on Android 4.1 Jelly Bean, with Samsung's TouchWiz UI plastered over the top. It comes packing a 1.2GHz dual-core processor, has 1GB of RAM and just 8GB of internal storage, which can be boosted with 64GB of space through the microSD card slot. There's also a 5-megapixel camera with an LED flash, while video recording maxes out 480p. The Galaxy Core also brings a VGA front facing camera. Interestingly, amid the plethora of low-end specs, Samsung has included dual-SIM support on one version of the device, allowing users to access both SIMs simultaneously, without having to reset the device. Buyers will also get a host of the neat software features Samsung bundled in with the Galaxy S4, such as Smart Stay, S Voice and Smart Alert. The dual-SIM variant will go on sale this month, while the single-SIM version won't arrive until July, according to Samsung's media release. No news of pricing or availability just yet, but we'll keep you posted.